I made this one for the Magnolicious Birthday Challenge. Thanks for looking. Absolutely stunning!! I love your card!! Tilda looks so pretty. Beautiful! What a great idea how you used the corner punch for a border!!!! I love it! Your card is such eye candy!!! Oh how lovely! Very, very pretty!!! o wow this is so pretty! Love how you have used the corner punch! very clever and that lace is so pretty. Tilda is just gorgeous too with her bow on her dress. I agree yummy eye candy! Absolutely beautiful! Love how you colored your Tilda, she's a cutie! The lace and the ribbon look gorgeous, love it! Soooooo gorgeous!!! 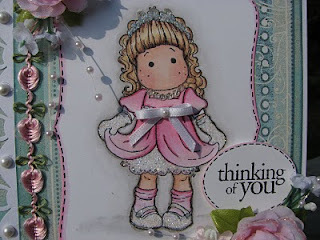 Love all the bling!The punched border is gorgeous and that ribbon is a show stopper! Tilda is simply DIVINE. Gorgeous! Your layout is absolutely gorgeous and I love all the embellishments you added. Stunning!